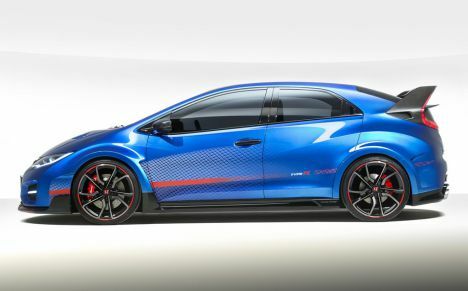 With the automotive world about to descend on the Paris Motor Show 2014, Honda has released further details of the eagerly anticipated new Civic Type R.
Power will come from a 2.0-litre i-VTEC engine from Honda’s next-generation Earth Dreams Technology series. Producing more than 280 PS, it will deliver unmatched performance against any previous Type R, including all generations of the Civic, the iconic performance-oriented versions of the Integra, Accord and even the NSX. While complying with strict Euro 6 emissions regulations, this is a Honda Type R powerplant like no other. With its predecessors naturally aspirated, the new unit benefits from a turbocharger, boosting low-end power delivery. Combined with the high-end performance synonymous with Honda’s VTEC technology – and much-loved by fanatical Type R owners – the new model promises to deliver a sensational driving experience. The all-new Civic Type R has been developed and engineeredfor European drivers. The car will be built at Honda’s state-of-the-art plant in Swindon, UK, arriving in dealerships during 2015. There will be a limited run of the the Mark 2 by Callum!